Place all ingredients in blender or food processor. Cover; blend on high speed about 30 seconds or until smooth. Pour into 8- or 9-inch square glass baking dish. Freeze 30 minutes. When ice crystals begin to form at edges of dish, stir mixture with fork. Freeze 2 hours 30 minutes to 3 hours longer, stirring every 30 minutes, until firm. To serve, spoon into individual bowls. 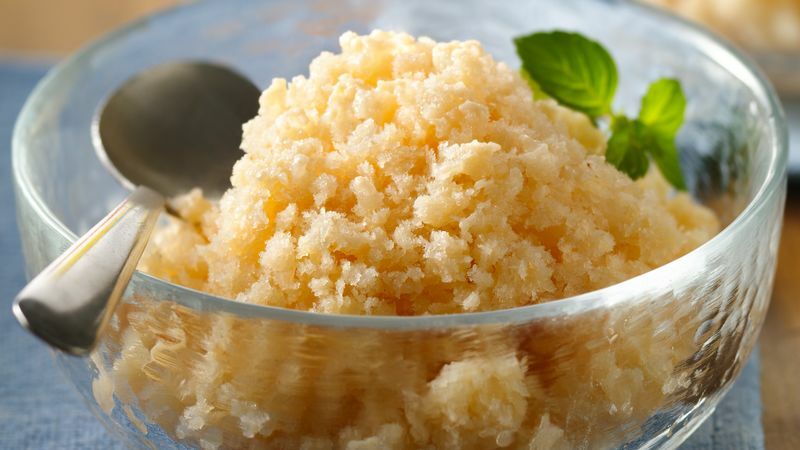 A true fresh cantaloupe flavor makes this granita deliciously refreshing. For a frosty, slushy drink, make the recipe as directed, spoon into 10 serving glasses and gently stir 1/4 cup sparkling mineral water or ginger ale into each glass.